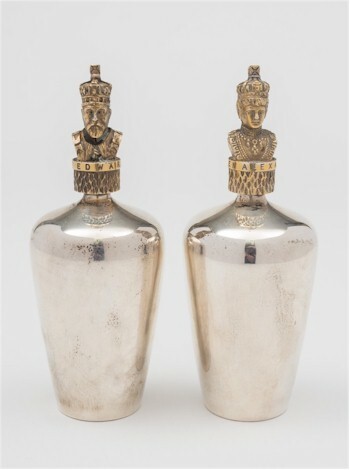 A pair of Stuart Devlin scent bottles (FS26/92), sold for £420. They say that beauty is in the eye of the beholder and the value of a piece of silver cannot always be determined by its weight and so it is with small collectable pieces of silver. 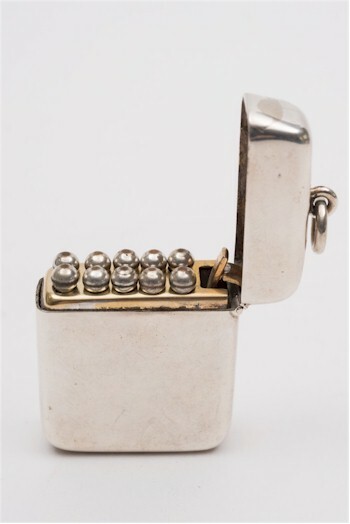 Whilst large pieces of silver such as tea services, salvers and card trays have fallen out of favour, the smaller novelty and more unusual pieces are still well sort after by collectors and aficionados. Two Stuart Devlin silver eggs (FS25/79) sold for £600. 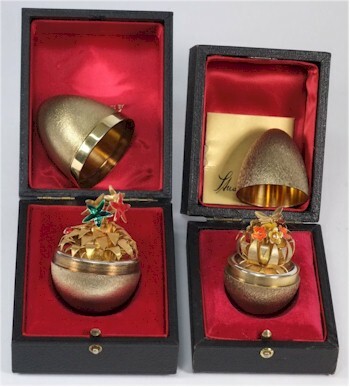 One of the most collectable silversmiths of the modern era is Stuart Devlin who first produced silverwares in the late 1950s and who went on to produce Surprise Eggs during the 1970s. The eggs had a lift off lid enclosing a surprise such as a silver gilt fish, a clown or a floral spray. Usually limited to a small number, each egg is numbered as well as hallmarked. There values can vary from between £200 and £500 depending on the subject of the surprise. Devlin also produced small scent bottles commemorating King Edward VII and Queen Alexandra, which were limited to a run of twenty five pairs. Recently included in one of our Fine Art auctions, a boxed pair realised £420. Not only are recognised silversmiths collectable, sometimes it's just the novelty or quirkiness of the object that raises it above the ordinary, and for some reason table condiments seem to be a favourite area for novelty. 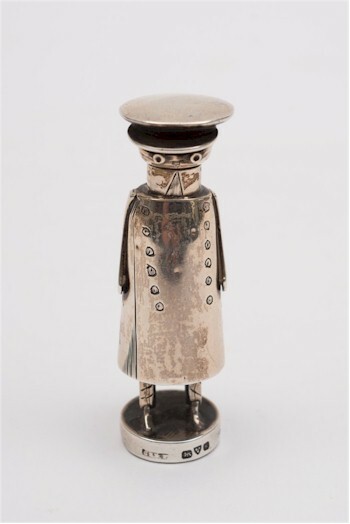 A novelty salt in the form of a uniformed chauffeur (FS26/94), which realised £340. 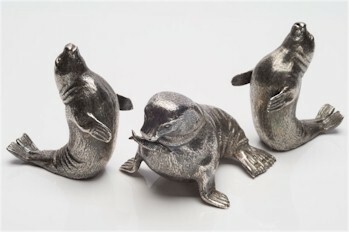 An Elizabeth II novelty cruet set (FS23/51) modelled as seal and pups sold for £900. How many people sit down to a table with silver condiments in the form of a seal with two pups, or a 2.5" high silver salt in the form of a uniformed chauffer - not many but the novelty value and the need for something different pushes these pieces far beyond their base silver value. It's not just we British who enjoy a novelty condiment; the Dutch are up for a laugh too, as can be seen from Dutch silver condiments in the form of a kissing couple. 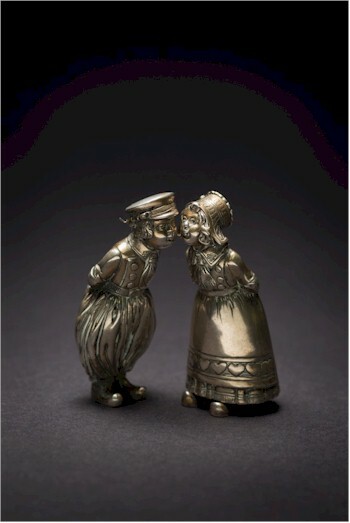 A pair of Dutch silver condiments (FS26/113) modelled as a kissing couple fetched £130 in April 2015. 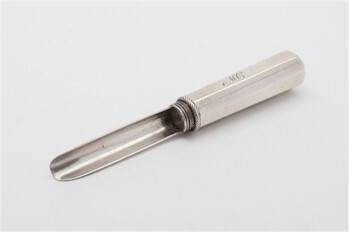 It's not necessarily modern or novel pieces that are collectable: two examples that sold recently were a George III apple corer made by Joseph Taylor in Birmingham in 1811 that sold for £160 and a George V silver shooting peg selector which weighed less than three ounces that sold for £520. So it is a case that size matters and small is beautiful. A George III silver apple corer (FS25/91) realised £160. A George V silver shooting peg selector (FS26/101) sold for £520.